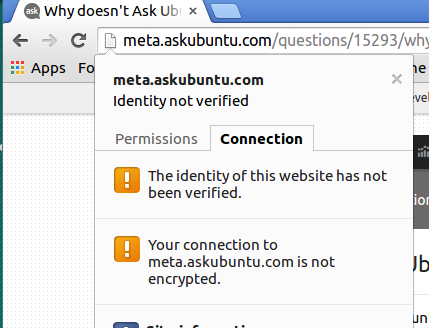 Why does Ask Ubuntu use plain ol' HTTP? In this day in age, I don't see any reason why it shouldn't be HTTPS. Isn't this a huge security risk? They (Stack Exchange developers) are working on it. It's complicated. Not the answer you're looking for? Browse other questions tagged feature-request status-deferred https . Allow formatting in tag wiki headers. What happened to the chat-feature module on the Questions page?